This version of Laphroaig is a World Duty Free(UK) exclusive. Like all Kildalton malts, whiskies on the south coast of Islay (Ardbeg, Laphroaig, Lagavulin), this release has attracted much whisky-nerd interest sparking forum discussion and debate (HERE and HERE, to cite just two). We bought a bottle on the way out of Heathrow. TO DRINK with FRIENDS and FAMILY. I emphasize this because some complete shmuck(s) have already posted bottles for sale on eBay and the like (I will not put links here). One has a BUY NOW price of £250 and the other has been bidded on and is currently at £145. I have mixed feelings about collecting whisky as it is, but to each their own. Who am I to judge? But this kind of profiteering is absolutely disgusting. Go buy and collect stamps and baseball cards and Nazi paraphernalia... please leave the water of life alone. DON'T SUPPORT THIS BEHAVIOUR!!! Drink, be merry, and be kind to others. Tasted with SK amongst candles and beer in Oslo (and again this morning with Kristin under more controlled conditions... in bed). For other Laphroaigs had on the mission, click HERE. Very viscous, and I usually don't mention this, but it has extremely slow legs. Big sweet bouquet. Strawberry gum and vanilla tobacco, licorice and cigarette smoke. Coca cola bottles (gummies). Sweet and quite yummy while simultaneously being carbolic/phenolic, smoky. Soft and welcoming. Dirty, angry, and somehow charming. Italian 'confetti', white candy covered almonds. Sweet, melons and Sprite. Cashew nuts and Coca Cola. "It is not as peaty as that Skye malt," said Svein. "Talisker," I say. "Yes, it feels lighter but sure, you can feel the peat. The alcohol flavour somehow subdues to the, sort of, the flavour." I find it very pleasant at cask strength. Great, clean initial fruity impact that expands mid-palate with syrupy and oily flavours and textures. Long sweet fruity finish with some ammonia, freshly cut wood, and the taste of the smell of new cotton t-shirts. 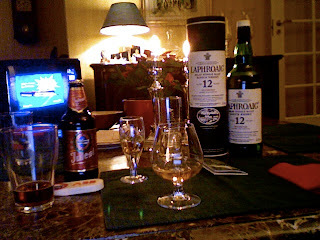 Kristin says, "Everything you're expecting from Laphroaig but it its just more subdued." An interesting Laphroaig. It is a more refined, elegant Laphroaig. More Ardbeg than any Laphroaig I have ever had. Kristin enthusiastically agrees, "yes, like drinking in the warehouses at Ardbeg with Stewart, the feeling of positive memories that was brought back with my first smell." Kristin is the peat freak in this family, so her enthusiasm is to be expected with this dram. Espen, her brother, took one whiff ans said, "whew... for advanced users." It's not worth £250. "Not at all." But worth every penny Laphroaig charges for it at UK Duty Free. Enjoy it, don't pirate it.